Recently the New York State Medical Board has enforced an existing code requiring that all elevator machine rooms in all hospitals and nursing homes in New York City be protected by fixed fire extinguishing systems. The New York City Building & Fire Codes and Fire Department prohibits most conventional fire protection systems, sprinklers and gas systems, in these rooms. The New York State Bureau of Quality and Surveillance, Center for Health Care Quality and Surveillance brokered a deal with the New York City Building and Fire Codes and the Federal Government to accept an alternative (non-aqueous) extinguishing agents for protection of these rooms. Since these rooms have many openings the use of NFPA 2001 compliant gas fire extinguishing systems is extremely difficult. 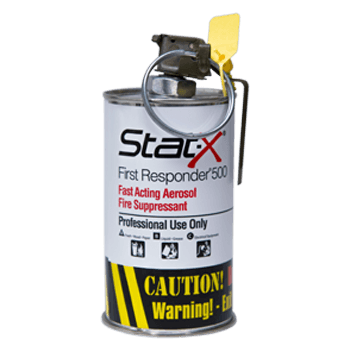 Stat-X® systems do not require sealed hazard areas like Clean Gas Solutions. Stat-X solutions are easy to install and maintain they are an excellent choice for protection for elevator machine rooms. Although this has only been enforced in New York and Illinois to date, we see the elevator machine rooms as being an application for promotion by our certified distribution and a viable and accepted solution for end users. Please contact the state medical board of your state to determine their position regarding fire protection requirements in elevator machine rooms for medical facilities.